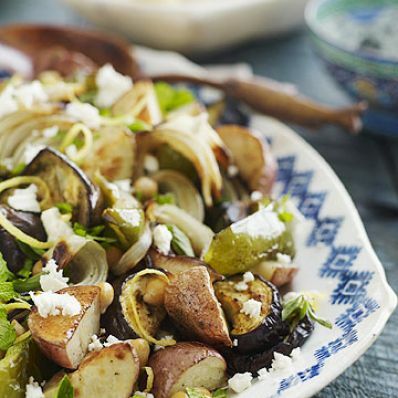 1 of 3 Heat oven to 425 degree F. In a large roasting pan, toss together the potatoes, eggplants, onion, green pepper, 2 tablespoons of the olive oil, the garlic salt and pepper. Peel off the lemon zest with a peeler and add to mixture. Reserve lemon. Roast vegetables at 425 degree F for 30 minutes, stirring twice. 2 of 3 Add chickpeas and roast an additional 15 minutes. 3 of 3 Stir in juice from lemon, oregano and mint. Top with feta crumbles and drizzle with remaining tablespoon olive oil.